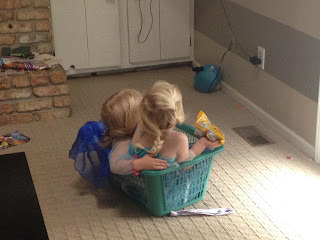 In preparation for twins, I read lots of blogs about the magic of their special friendship. Twin speak was one thing I really looked forward to--the special language concocted between them. There were a couple hiccups with this for my twins. We enjoyed their babble before their first words. Addy caught onto English first, while Ella struggled with ear infections for three consecutive months. Once we cleared it up, though, Ella took off. The more Ella talked, the less Addy did. Addy was always shy but friendly. What we noticed is she preferred speaking without words--touch was her love language, though she rarely sat still enough for hugs. She wasn't concerned about talking. After all, why would she need to when Ella spoke for both of them? What about this twin speak? Fast forward to them now, age 3.5. You see my girls are very independent. Sharing was a struggle at first (and sometimes still is), but they have an unusual understanding: they exchange toys constantly. If one of them takes a toy, the other finds a new one, and then they'll switch. And while they do this, they DON'T speak at all. So odd. We occasionally take walks to the park--where they now pull the wagon, rather than ride inside--and when they play on the playground, they play independently. Then Ella will say, "Come on, Sissy." They'll roll down the hill, giggling. Without a word, they'll make their way then over to slide and jiggly bridge. They crawl underneath and play with the stones. They point and look at each other, then look back at their own stones. AND DON'T SPEAK. Then the other day, we had an actual fight. With screams and hitting. A rare occurrence in my house. For once, Addy was to blame, so I squatted down beside her and told her to tell her sister sorry. She glanced shyly at me and muttered, "No." We did this three times, and finally, she reaches her arms toward Ella and mumbles some unidentifiable words. Ella stares at her and says something back. Then they hug each other and rush off together, friends again. Finally, after 3 and a half years, I witness twin speak.